Time spent learning at school relates positively to school achievement even after considering other factors, such as the quality of instruction. In effect, disadvantaged students tend to benefit even more from greater exposure to school. 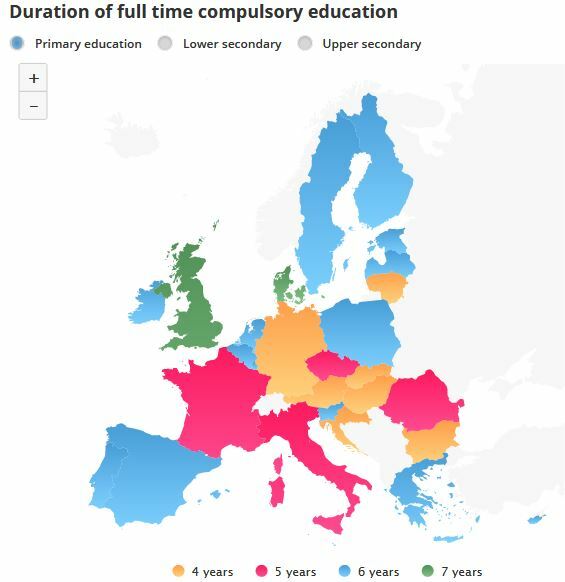 Students in the EU spend between 8 and 12 years attending compulsory schooling.
. While the average expected years of formal education for pupils and students was 16.3 years in 2000, it was calculated at 17.2 years in 2005, 17.6 years in 2010 and 17.5 years in 2015. You can check the evolution of this trend for each Member State when you click on the map.